Irving Berlin’s musical classic. To be presented December ‘14 – January ‘15. Looking for Actors, singers, dancers of all ages. 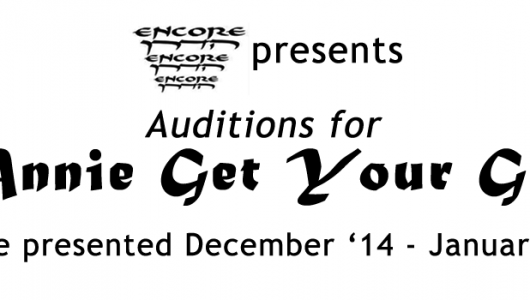 Young singers and dancers especially encouraged to try-out! For further details, please contact robert@encore-etc.com or call (054) 546-4215. Or, see the Facebook event. Wednesday, July 2, 7:30 p.m. to 10:00 p.m.
and Thursday, 3, 7:30 p.m. to 10:00 p.m. Please prepare a song from the show or similar musical, be prepared to read a page of dialogue (provided before the audition), and do some improvisation. Supplementary auditions for chorus will be held in early September. Rehearsals start before Rosh Hashana. Annie Get Your Gun has had highly successful revivals in recent years at both Goodspeed Opera House (Connecticut) and Glimmerglass Opera (Cooperstown, NY) and is currently touring the UK. The cast (which we intend to number 45-50) will include several children, both in speaking/singing parts and the ensemble. We are very excited about presenting this wonderful musical treat for the entire family. Come join the fun in Annie Get Your Gun!